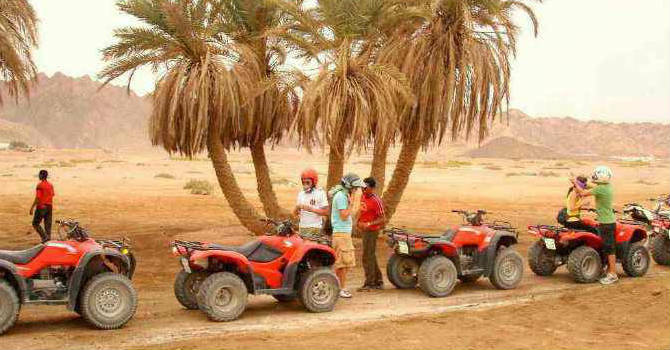 Book the trip and relish unique soft expedition and memorable experience of Sinai desert near Sharm El Sheikh, we will pick you up from your hotel in Sharm and transfer to the quad station for short introduction about safety procedures and test drive. Take your dune buggy for 2.5 hours across the sand dunes and the extraordinary rock formations during sunrise or sunset times to wander the amazing colors of the desert arising in all their magnificence. You will explore the Bedouin villages, tents and graves, stop also in one of this traditional tents to savor the healthy Bedouin tea. You will get enough time to take pictures of the lovely desert scenes before driving back to your hotel.